Eragon is a fantasy novel based around magic and dragons, being a world where dragons still exist and magic can be used. 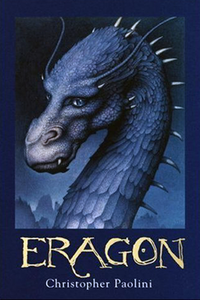 Eragon is the protagonist, and this story starts off in a small countryside town named Carvahall, where Eragon is living with his uncle Garrow and his cousin Roran trying to make a living on a farm. Eragon was out hunting, trying to provide some food and money for his home when he found a strange stone in the woods with a nice glimmer to it. He picked up the stone and planned to sell it for money. A few months later, having not yet sold the stone, Eragon heard strange sounds from the stone and saw cracks appearing on it. A few moments later, he found a small blue scaled dragon had appeared out of the stone and realized it was not a stone, but an egg. The dragon then touched the palm of his hand and he felt an odd cold snapping feeling and then passed out. This is where his story begins. Christopher Paolini’s writing style has been one of the best writing styles for me to read. It is simple, yet it tells complex details about what is happening from the perspective of the main protagonist Eragon. This is quite helpful for me because I was young when I first read the novel. This book’s audience is mainly the fans who are interested in fantasy like the famous Harry Potter, and generally younger age range from around 8 to 18 years old. In conclusion, the book is a great story with several books of its series that are generally easy to follow for young audience members. I hope that you read the book.